These leather collars are made of the finest quality latigo leather and are handmade by the Amish. The stitching is all reinforced. These collars are built to last a lifetime. We love to use this type of collar for off-leash protection training. Your leash can come off and you can still securely hold your dog before releasing them. We have also found that we like this collar with handle for Agitation work and also for Search & Rescue. The standup handles are tough and durable and the collar fastens with a heavy duty buckle. We carry leather collars with handles that are 1" wide and 2" wide. I bought this collar for my shepherd 4 years ago. It is still great. I have not found finer quality anywhere. These collars are spectacular! I have been debating for a long while about getting custom leather collars for my two rescued Coonhounds. One is a Redtick, recently rescued, and he is 2 years old & incredibly strong. And very much a puller on the leash! I was happy to find a 2" wide collar with a handle (there is a picture of him in it and a review there as well). 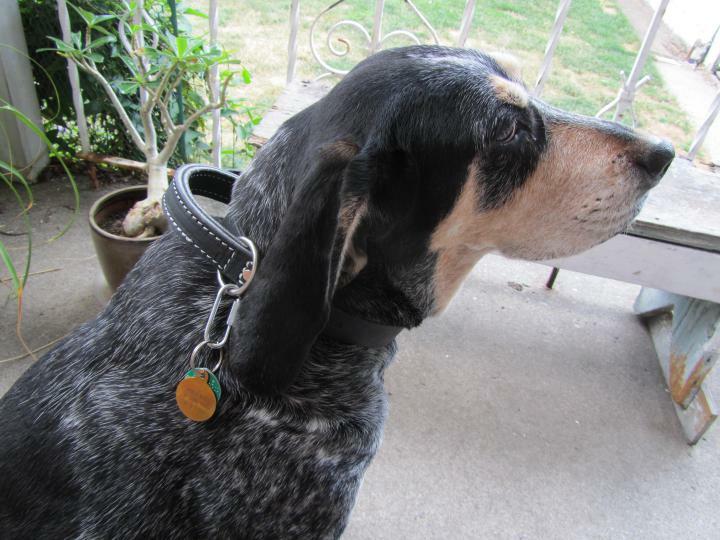 The other dog is a Bluetick, and she is my senior. She has zero issues walking, I just wanted to get her a great collar. So I got her this 1" collar in black. It is very comfortable on her and she looks great. While she has been trained to walk perfectly, she still gets a bit crazy in the car and in the waiting room at the vet, so that handle will be very nice, and the extra tab of leather under the buckle will help keep her from choking as badly as she does on her older collar. I'm glad I went with Leerburg - the other ones I was considering were well made, but they were more like vanity leather collars - fancy colors and stones with their names and such. Although they were pretty, I honestly have to say that I like these better and I made the right decision. The leather is supple and a high quality, and they are incredibly well made. These collars will survive both dogs and will go on to the next generation and probably the ones after that - so I'll have to put them in my will! The only thing I have to do is get them just a tiny bit shortened, as the end of the collar flops out a bit too much on both dogs. But I expected having to do that. Getting them trimmed is no big deal at all, I know a shoe guy who is local. These collars are SO worth getting! You will not regret it. My husband and I really love this collar! Very useful at home and outside during a walk. We have much more control over our very active and highly energetic 8 m.o. GSD. The collar is very well made, it is reliable and I am sure the size Large will perfectly fit our boy when he becomes fully grown up. Great thing! I just wanted to write and tell you what a great collar this is. I have an assistance dog that will often help me stand or get my balance. This collar allows my dog to assist me during those times he does not have his vest on.